Welcome to the home of Ancora! A Cupertino-based a cappella group, Ancora has been singing together for local audiences since 2005. 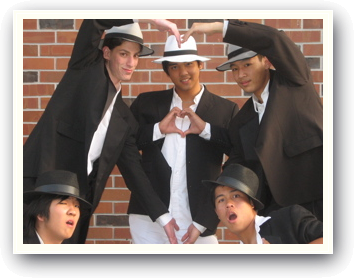 Influenced by professional groups such as Rockapella and Boyz II Men, Ancora has supported the standard style of men's a cappella with youthful energy and a healthy dose of improvisational spirit. Ancora was founded at Cupertino High School in 2005 and has been continuing to sing together even after all original members have gone off to college. On this site you can find all of the members of Ancora, a bit of history about the group, and the recordings made in Spring 2007. Take a look around!